– Tribes: Ascend: An amazing FPS and definitely in my top 5 all-time favorite shooters. It has a very high skill ceiling, but once you get decent at it you’ll fall in love with the jetpack + skiing mechanics. Just don’t give HiRez, the developer, any money if you can help it…they employ some terrible practices that are a plague on the business. The game is free-to-play so, if you don’t like it, all you really lose is some of your free time. – Spelunky: Probably one of my all-time favorite games now. It is a rouge-lite platformer that is hard as nails but tons of fun! Rest assured that you will die over and over and over when playing this game. I have this for my PS Vita and it is so much fun to play. You can download the free version as well, which is still very fun but not nearly as polished. – Muramasa: Rebirth: This is a hack n’ slash 2D scrolling game that was originally released for the Wii. But this version was released for the PS Vita, and it is definitely one of the most artistically beautiful games I have ever seen. The animations are super fluid and the environments are colorful and interesting. The gameplay is very frantic and solid to boot! – Phantasy Star Online 2: This is just an honorable mention, unfortunately. But what little of PSO2 I played seemed pretty promising. The game was supposed to release in the US in the Spring of 2013, but Sega delayed it. And nothing has been heard about it since. The game is available to play in Japanese (which is ok with the fan-made English patches). But the threshold of availability is too high for most US players, meaning it is too difficult to play with people that speak english without lots of planning ahead. I really hope this sees the light of day in the US and other countries besides Japan. This was also a pretty amazing year for music, atleast for me. Two of my favorite artists released albums this year, in particular one which hadn’t released material in many years. So while my musical tastes are probably a bit esoteric for most people, here are some releases that I greatly enjoyed this year. Now for something really cool! 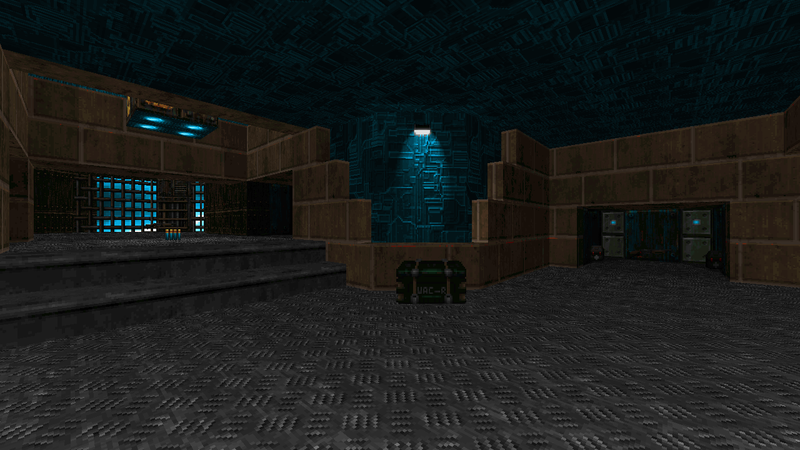 Revenant made a fantastically cool script which will render out Doom maps from “start to finish” in a .gif animation. Technically it just draws the lines as they are ordered and isn’t a line-by-line drawing as the author made it. 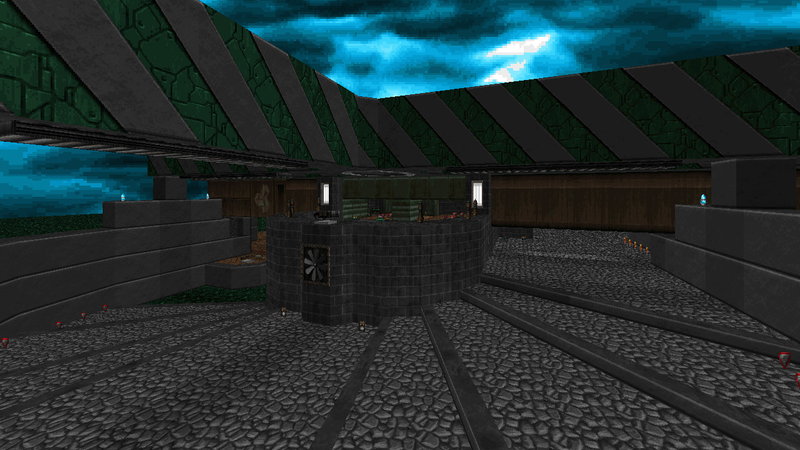 But in most cases, it gets pretty dang close to the chronological order of a map’s creation. 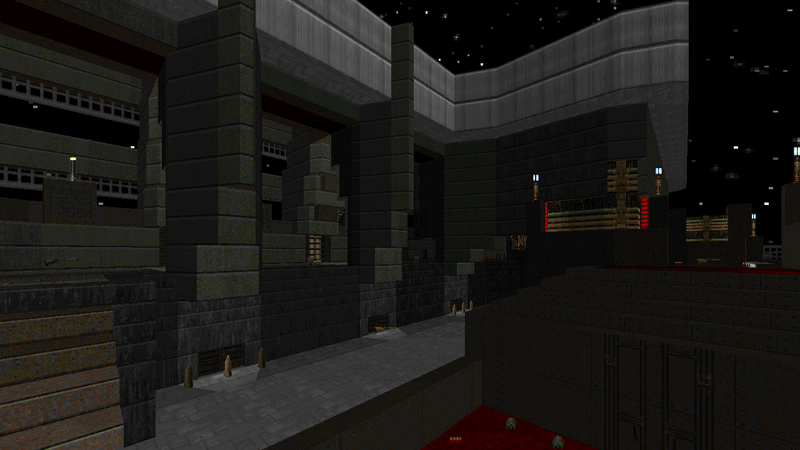 You can view the map creation .gifs for most of the Doom-engine related games right here. It’s pretty awesome to see how some of the original maps were pieced together! Of course, as soon as I saw this neat little program, I immediately wanted to see if it could handle one of the finished Vela Pax maps. At first it didn’t like numbers larger than 32768, but that was quickly fixed by Revenant. After about 5 hours of waiting for the .gif to completely render out, I ended up with this beastly animation of the creation of Vela Pax MAP01! Note that this was rendered using the “draw-shapes” option, since line mode created a .gif file that was about 45~ish mb in size and likely would have taken an order of magnitude longer to cycle through. As it stands, the current animation will take about 5+ minutes to completely cycle through. 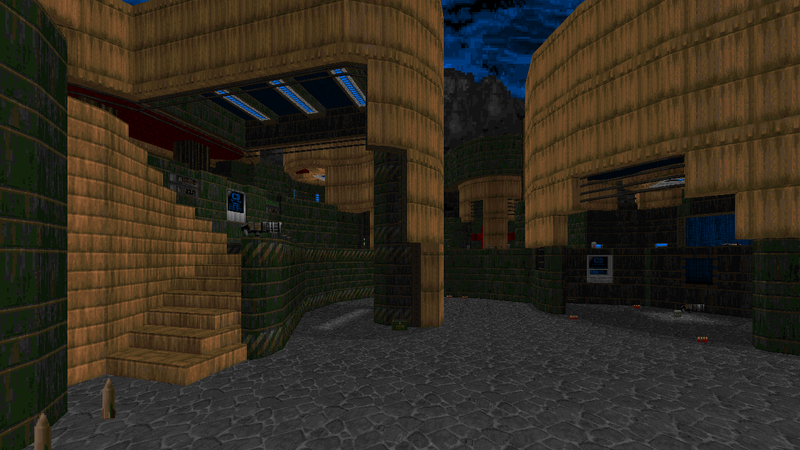 Here are a few of my other maps that have been rendered out using Revenant’s handy script. And of course, the YEDS team was able to plop together a delicious platter of 32in24 maps before the year ended. Coincidentally (or perhaps purposefully), this was the 13th 32in24 session, just in time for the end of 2013! This time the theme was Boom-compatible DM maps suited for 4-8 players, but with a small catch – the maps needed some sort of reference to food items, be it in their design, detail, or simply in the map name. I went totally overboard with this session, creating a grand total of 4 complete layouts, of which 3 were detailed by me and the 4th detailed by the almighty Xaser himself. I’m gonna post some screenshots right now since I didn’t bother to upload any shots of the finished, detailed maps after the release. But first, grab this delicious feast of a DM set! That pretty much wraps up my 2013 releases. But oh wait, there’s more! Doom recently celebrated its 20th anniversary, so my Supplice gang and I decided that it might be cool to release something related to the project in honor of Doom’s 20th. If you read my previous post, you’ll know that I had been working on converting some of my previous DM maps to the Supplice resources. 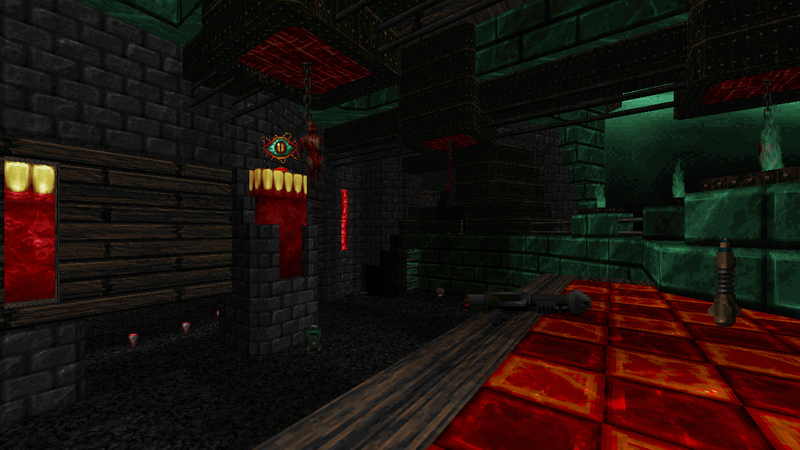 We had talked a small bit about doing a DM map set alongside the main project because of all the awesome new textures and graphics Cage and I had been churning out. So all of us pooled our time together to get some textures and maps in a screenshot-ready state, and I plastered a ton of screenshots in our project threads on the birth date. I was gonna post some here too, but…you know, da lazy never sleeps . So here they are again, in all their colorful, slightly-unfinished-but-still-pretty-finished glory! How do you find the motivation and creativity to make such detailed maps like this? I’d just stare at DoomBuilder figuring out where to start! 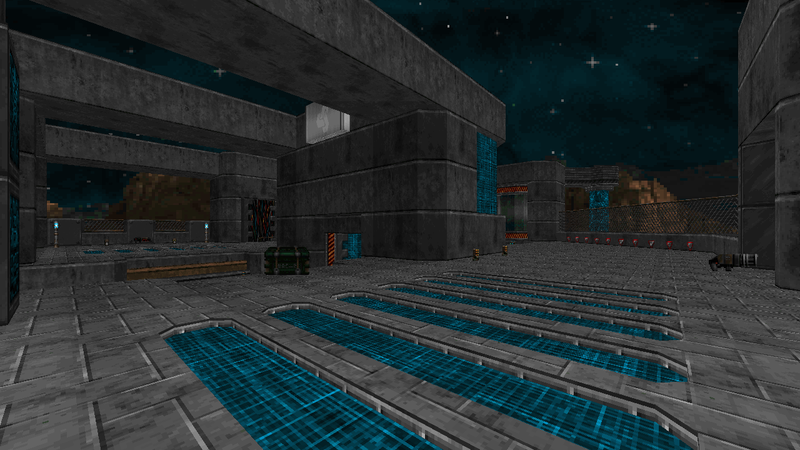 Some years ago I started contributing to the 32in24 projects, and that was the first real speedmapping that I did. That helped me out in many ways. 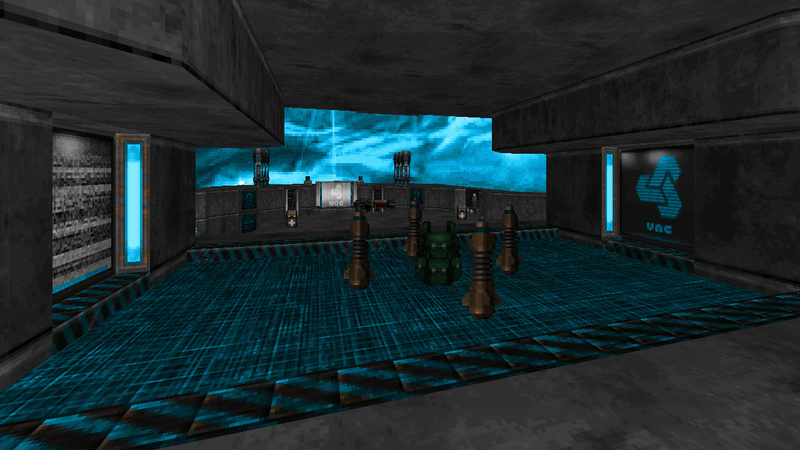 Basically just open DB with a general idea of what you want to make, and just start randomly drawing rooms. When your doing a speedmap, quality doesn’t need to be a goal. You just want to make something and be experimental with it to see where it takes you. Then when your done, step back at what you’ve made and analyze it. See what works, what you like, and what you don’t like. And use what you’ve learned in future maps. I also get a lot out of learning from other people and their creations. Thought I don’t have time to play everything these days, I always keep an eye out on what other people are making, especially the people who I find very talented. So play as much as you can, open up maps in DB when you want to see how something was made, and try to absorb as much as possible. Also having some great community members to help you out and give feedback is incredibly important. I really dig your tater tot tempest level. 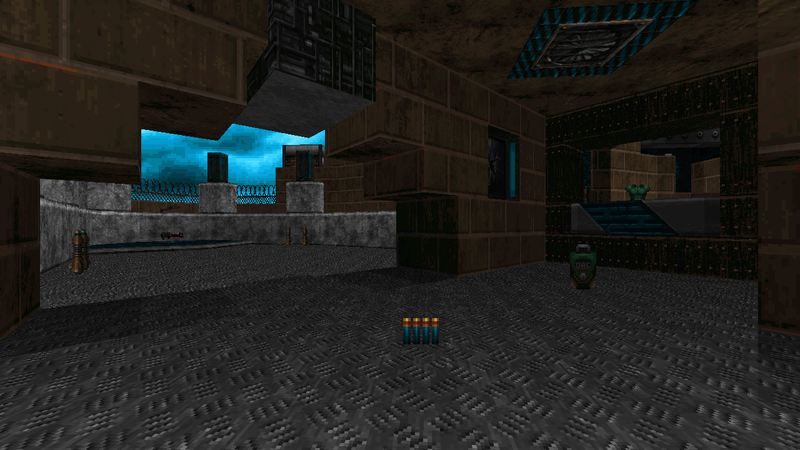 I opened it up with doom builder to find missing textures. 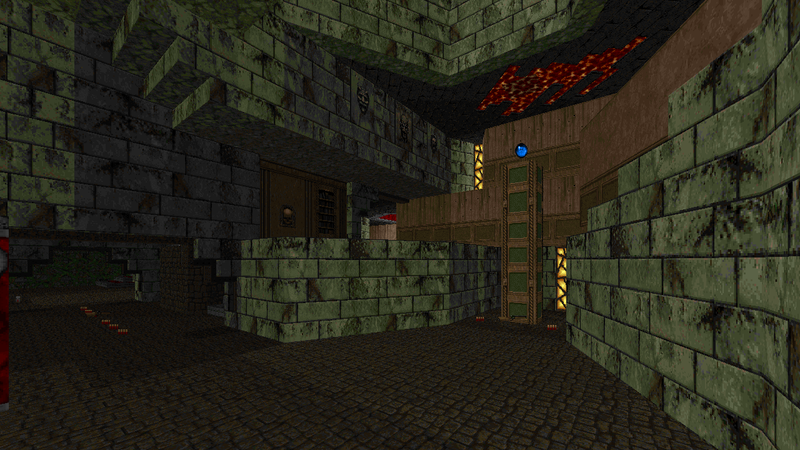 I found the post about the 32in24 #13 and found I needed the 32in24ctf-tex.wad. So i opened it with that resource and still i the textures were missing. 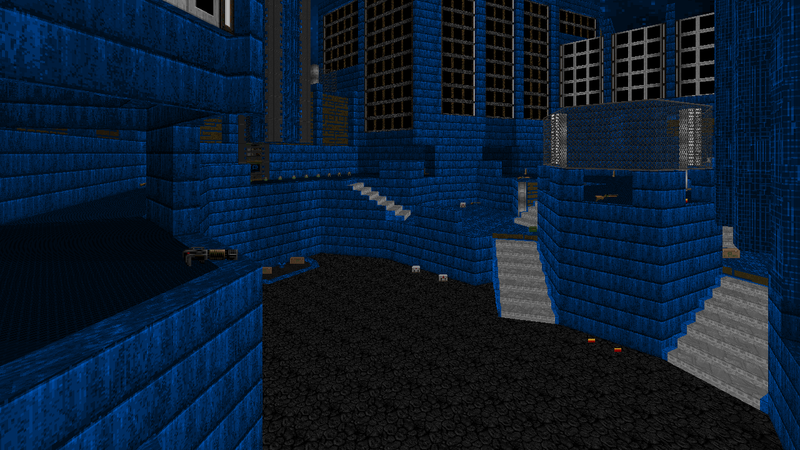 Basically i want to use the blue F_Sky1 texture you used. Also what grid setup do you use? At the stairs to the north of the middle courtyard there is an indentation in the wall and i noticed you have diagonal lines very thin and with consistent thickness. 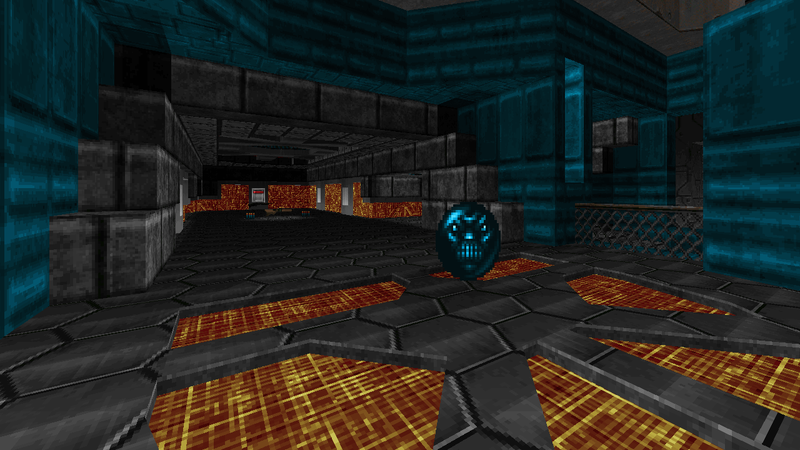 And the Mekworx logo you have, it jsut boggles the mind that you made the level in 24 hours. I’ll try to answer your questions the best that I can. I’m not sure how much you know about general wad editing so please don’t hesitate to ask for more details (you can drop me an email if you would like). So that sky texture is named ‘SKYHX2B’ in the 32in24-13 resource. 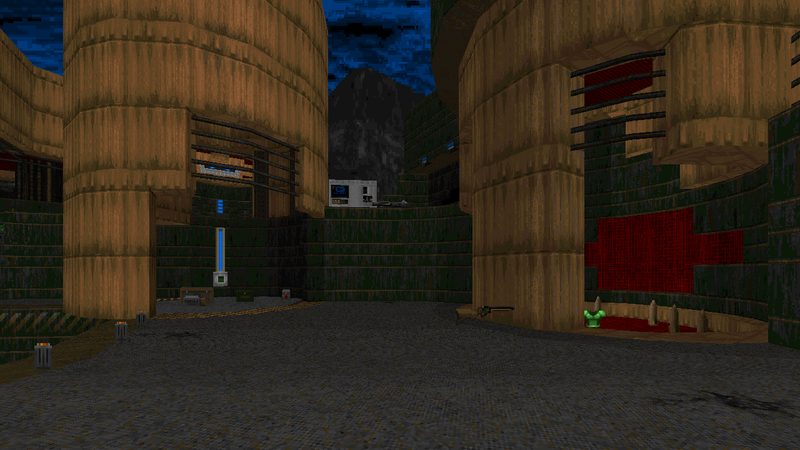 If you opened the map from the 32in24-13 release, it should have all of the textures; otherwise if you opened the standalone map .wad from the project thread, you would need that 32in24ctf-tex.wad. You shouldn’t get missing textures, but I would need more info on how you loaded everything in DB2/GZDB. In order to use that sky in the most basic way, you’ll need to rip it out of the resource (use SLADE if your not already) and insert it into your wad. 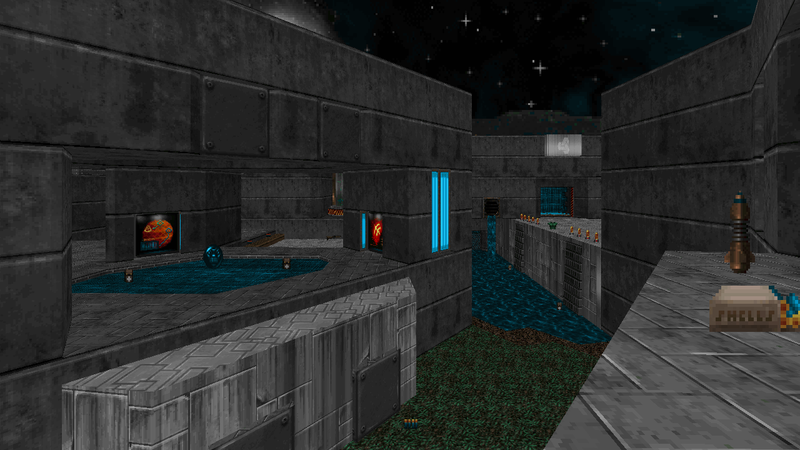 At this point there are a number of different ways you can get the sky to show up in your map, and it all depends on what source port and map format your aiming for. The quickest way to do it (vanilla method) is to insert the sky into your wad in such a way that it replaces the IWAD sky textures. 1. 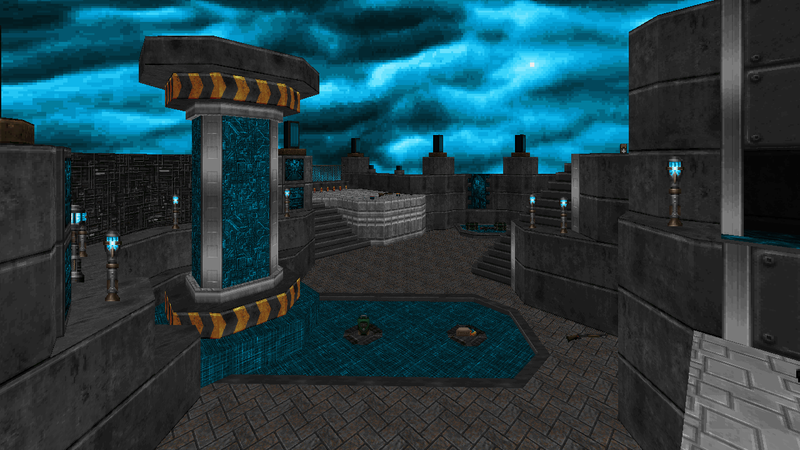 Find and rip the the sky texture (SKYHX2B) from the 32in24ctf-tex.wad (use the ‘Export’ function in SLADE). You should end up with a file called SKYHX2B.lmp. 2. Open up your custom wad in SLADE and create two new lumps called ‘PP_START’ and ‘PP_END’. You can do this with the ‘New Entry’ action in SLADE. These two lumps are markers which help certain sourceports find certain things in a wad. 3. Next thing you need to do is import the ‘SKYHX2B.lmp’ file into your wad (use the ‘Import Files’ function). Once you do that, you need to make sure SKYHX2B.lmp is between PP_START and PP_END. 4. Rename SKYHX2B to ‘RSKY1’. 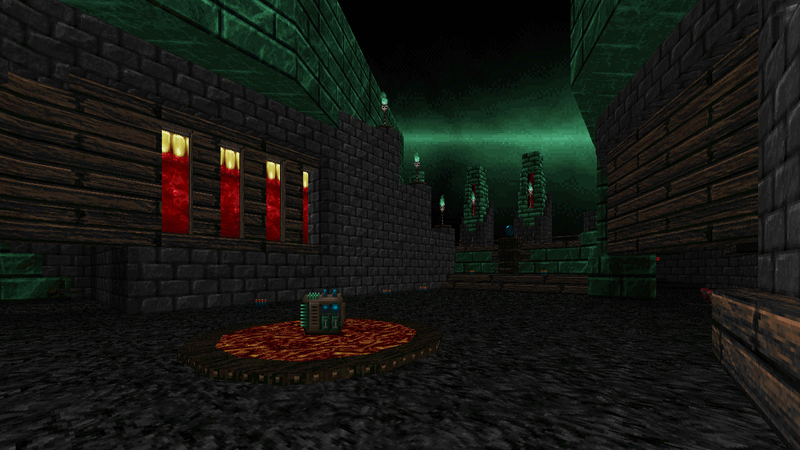 This replaces the vanilla Doom 2 sky with the new one. 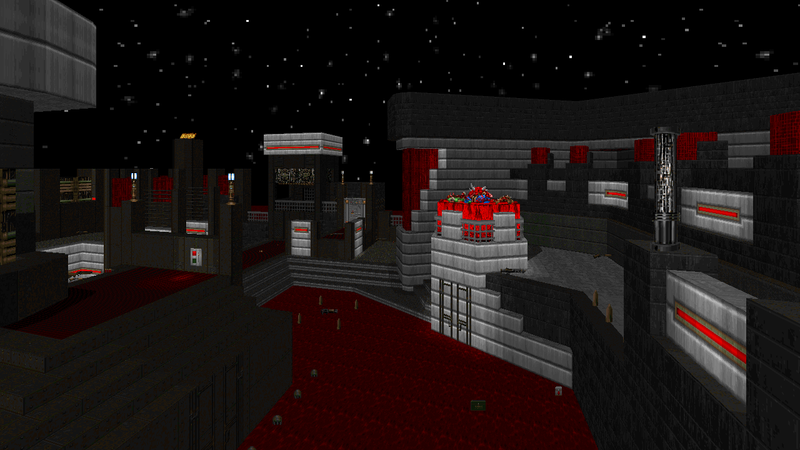 Depending on where you map slot is, you can replace ‘RSKY2’ or ‘RSKY3’ so it shows up for later levels. And that should work. This is the bare-bones method that should work across any sourceport. 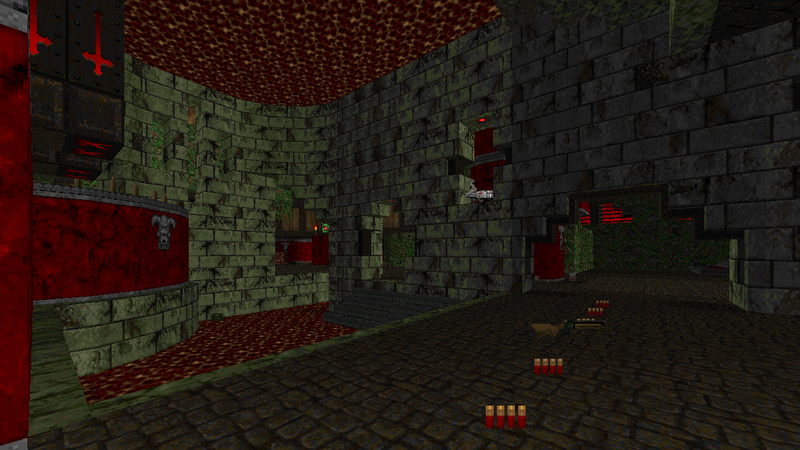 There are more advanced methods that are a bit more flexible (if your using a port like ZDoom). But I’m not sure what your aims are for your project, so this is the best advice I can give. To answer your question about grid usage, I don’t adhere to a strict grid. I tend to stick to 8×8 for general mapping, but then I will deviate to larger or smaller grids as needed. If your using Doom Builder 2/GZDoom Builder, the brackets  will let you adjust the grid on the fly, and I recommend getting use to doing that. 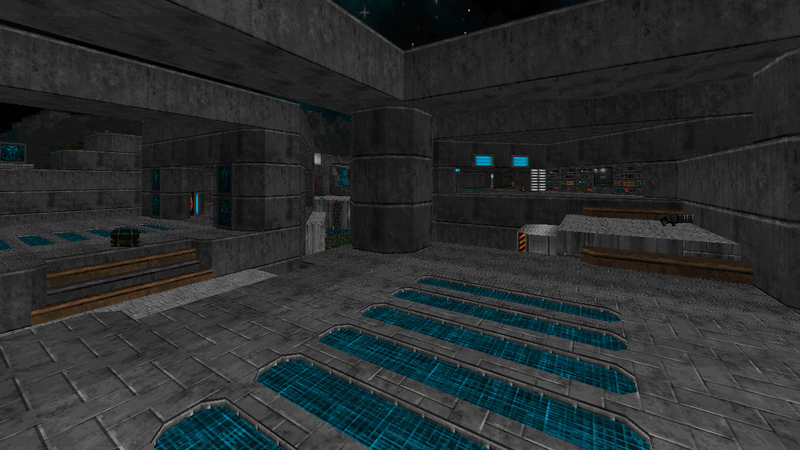 Smaller grids are handy when need more precision for intersecting architecture or certain details. Larger grids are nice for blocking out large shapes quickly and accurately. 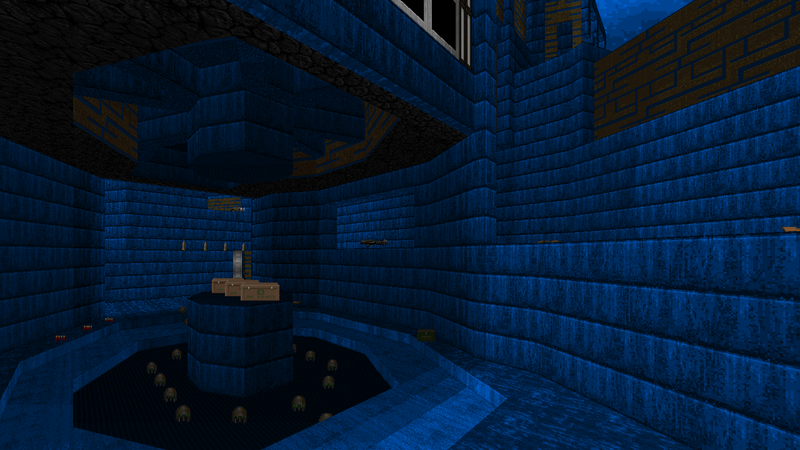 I like to stick with 8×8 for general purpose because it offers a nice balance and flows the best for my mapping style. I’ve contributed to almost all of the 32in24 sessions (save for a couple) and sometimes I’m not even sure how I’m able to make some of these maps so quickly. Though for the high-detailed 32in24’s, those sessions have separate gameplay/layout and detailing sessions…so at least as far as visuals go, those take place within a separate mapping session. Hey, thanks for the quick and detailed reply. I didnt have slade but i got it and it worked. 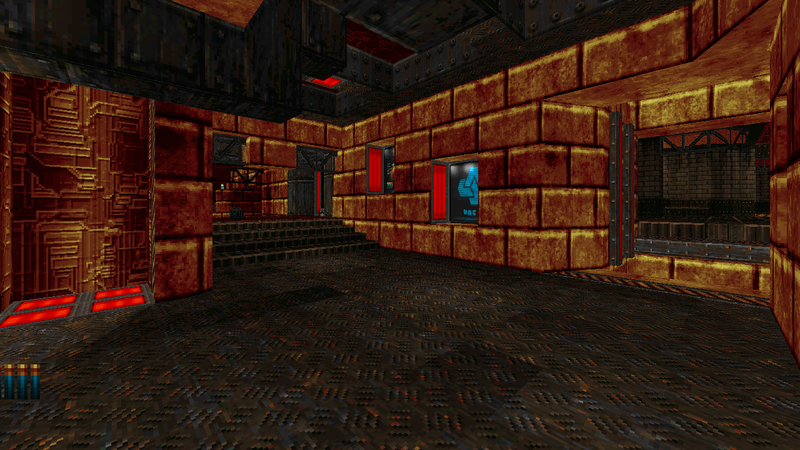 One thing i noticed is that i was using the F_SKY1 ceiling texture, whereas this one is a wall texture. The whole time i was thinking there is only 1 sky texture. 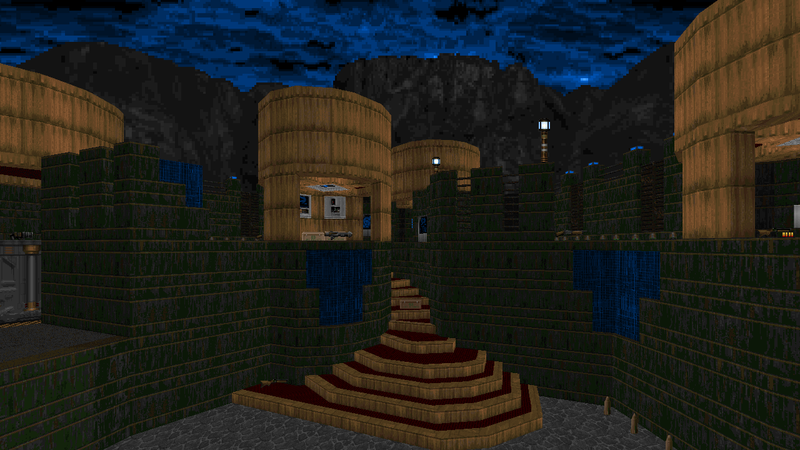 In your map it seems you use it as the F_Sky 1 texture which when i load up your map (its not the standalone one, but map 9 in the 32in24 wad)it shows up as a question mark. Also it seems you use the SKYHX2B in conjunction with SKYWALL2. 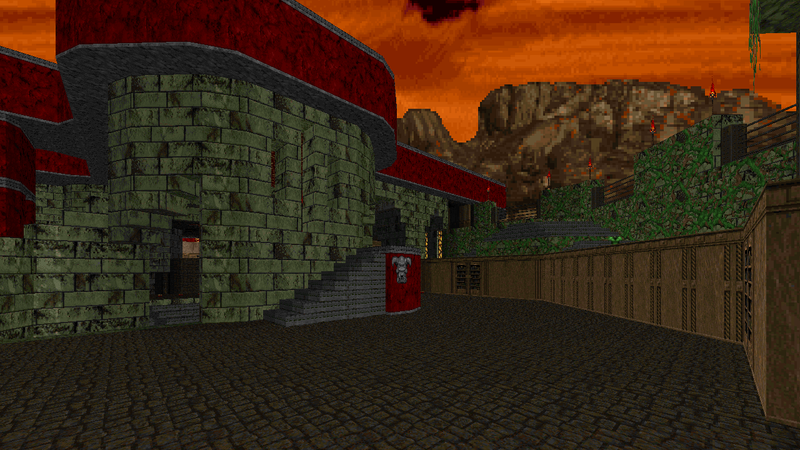 Though i cant find those textures when i load up your map in doombuilder. I just quickly looked up doom sky tutorials and i think all these questions will be answered in the Sky Box tutorial. So instead of wasting your time i will check that out later when i have time. This whole time I didnt even know the concept of Sky Boxes. Anyway my email is KonradPawlak438@gmail.com. If you can suggest to me some tutorials or resources for learning about wad making that would be good. 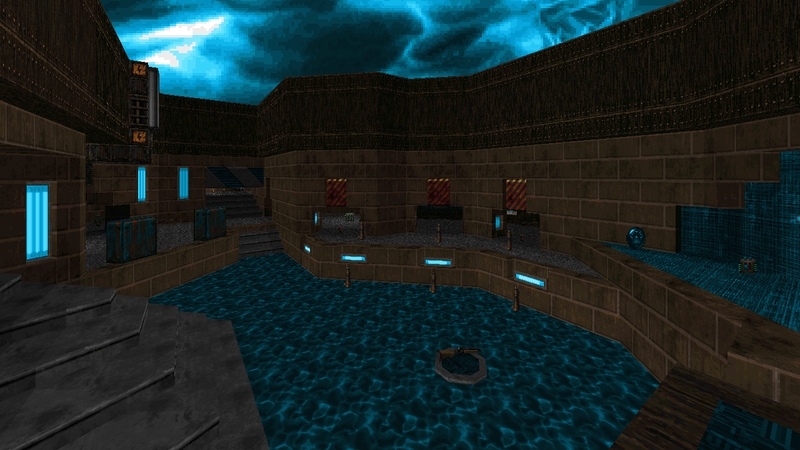 F_SKY1 is just a placeholder to show you where your sky texture will appear in the map (only when used as a flat). The sky that’s used in a particular map slot is defined outside of the map itself. 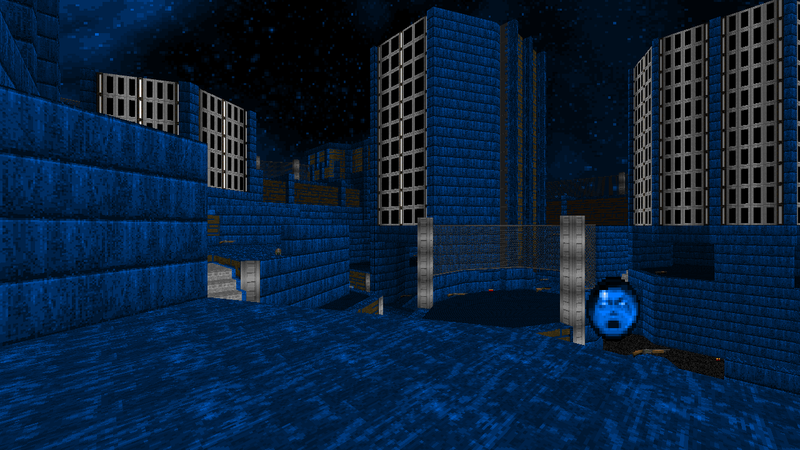 Depending on the map format and source port your aiming for, you have various ways to change a sky texture. 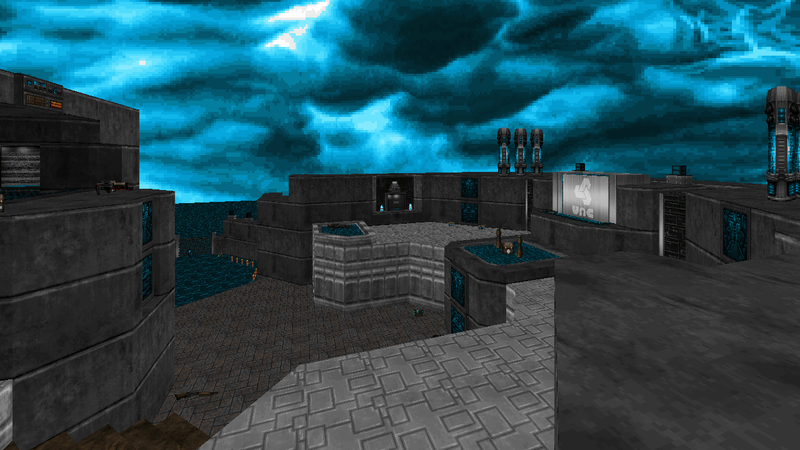 In vanilla Doom, the sky textures used on any particular map are tied to the map slot (MAP01 uses brown sky, MAP12 uses burning city sky, etc). Each sky is tied to a set of maps, and you can easily replace them by replacing RSKY1, RSKY2, and RSKY3 like I mentioned in my previous post. This will work for ALL map formats and source ports, though you can’t have more than 3 skies and you can’t change which map slots they appear in. 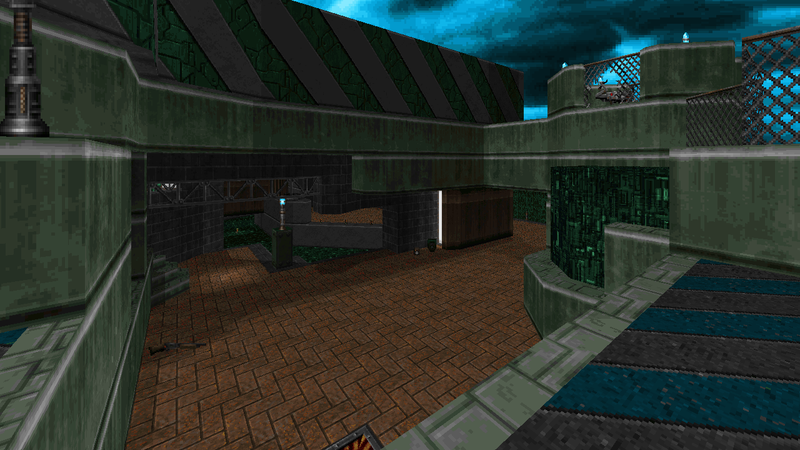 For my 32in24 maps, since they are Boom compatible maps, we use a line action called “Sky Transfer”…this is why you were seeing the sky in the used texture pool. This method let’s use transfer any texture we want into a sky. If your using ZDoom, you can make use of the MAPINFO lump to define which map slots use which sky texture (check out the ZDoom wiki on how to use MAPINFO). Success! I couldnt find SkyMix6 in SLADE only the blue sky and mountains seperately. 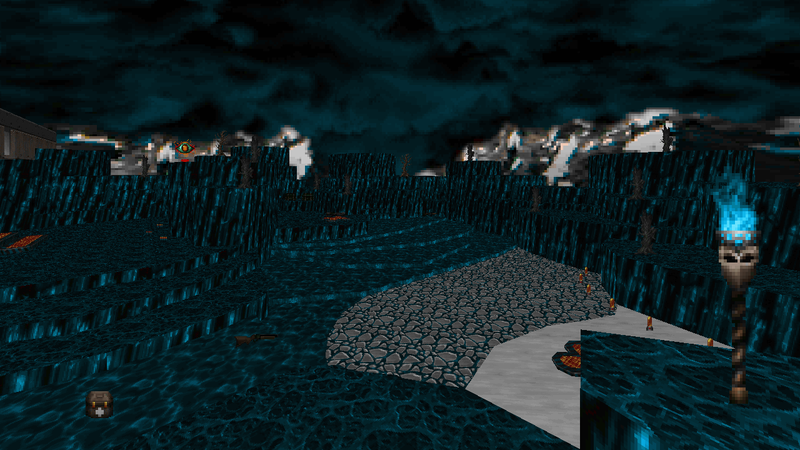 I was using the vanilla doom 2 originally, but opened it up as zdoom (doom in doom) to make the skybox. I had to delete the brown sky because it didnt overwrite. So i guess the skybox isnt necessary anymore, because i replaced the original texture? I use zandronum to play. 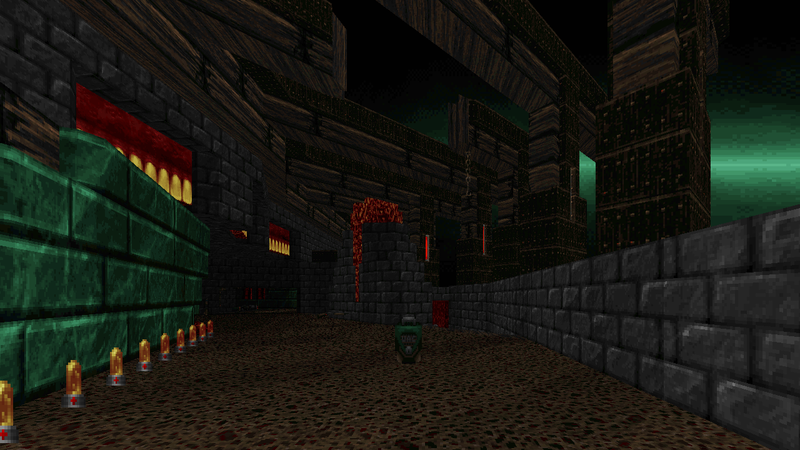 So if i can edit zdoom and play it in zandronum, then i will say Zdoom. Nice! SKYMIX6 might actually be a composite texture made in the TEXTURE1 lump (basically this allows you to make new texture composites using existing texture patches). That stuff is a bit more complex though; I’d probably send you an email with more detailed instructions if you really want that exact sky texture. Since your already digging around in the 32in24-13 wad, I would recommend opening it up in SLADE and taking a look at its MAPINFO lump. 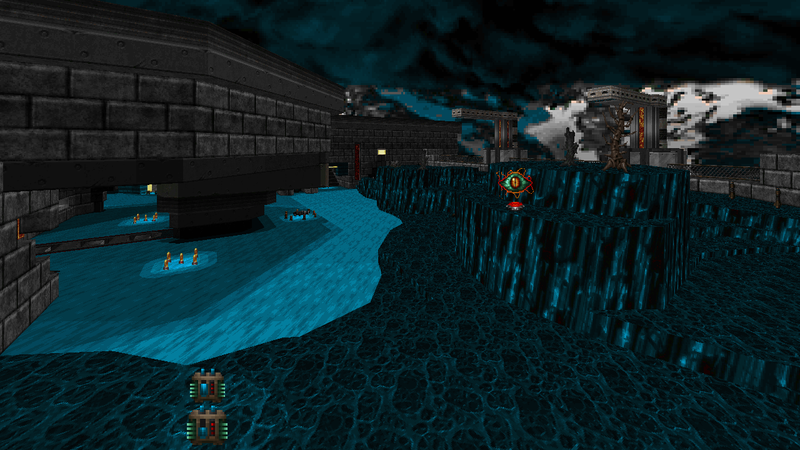 Generally speaking, this is how I learned a lot of Doom modding…by taking a look at how other people have done things. (though I should note that 32in24-13’s MAPINFO uses an older syntax…it will still work for you needs though). 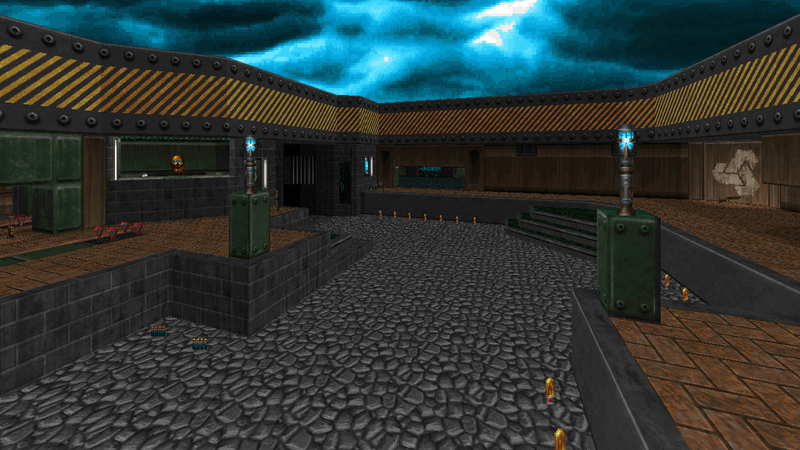 The steps required to get a sky texture to show up in a ZDoom map are pretty simple. If you didn’t have trouble doing it the vanilla way, then you’ll be able to do this very easily. 1. In your wad, you need to make two marker textures: ‘TX_START’ and ‘TX_END’. 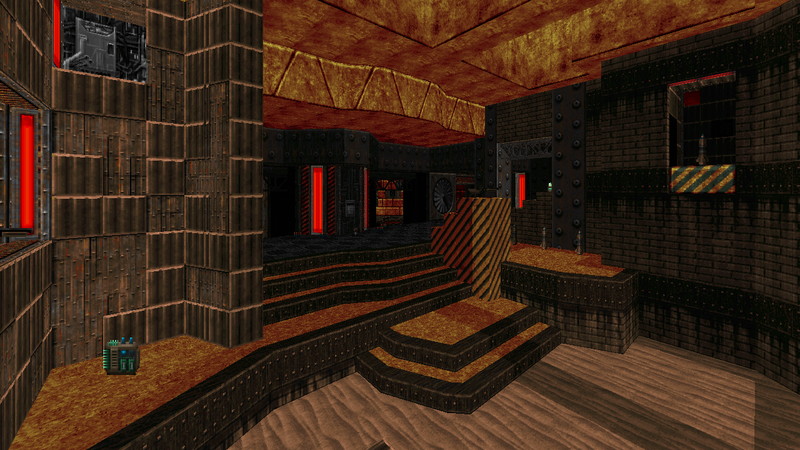 These are similar to PP_START/PP_END, but they are used for ZDoom and you can mix both wall textures and flats. 2. Toss in your sky texture between these markers. It can be named whatever you want it to be so long as it is 8 characters long or shorter. 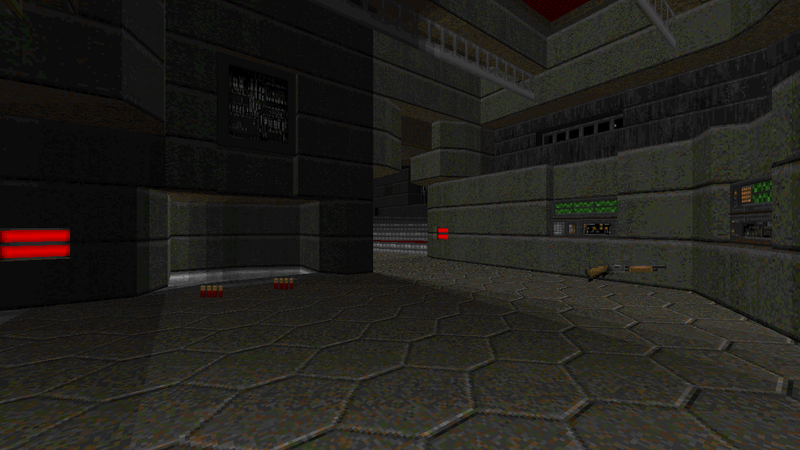 If you want custom textures as well, just toss them inbetween the markers and they should show up in the map editor. 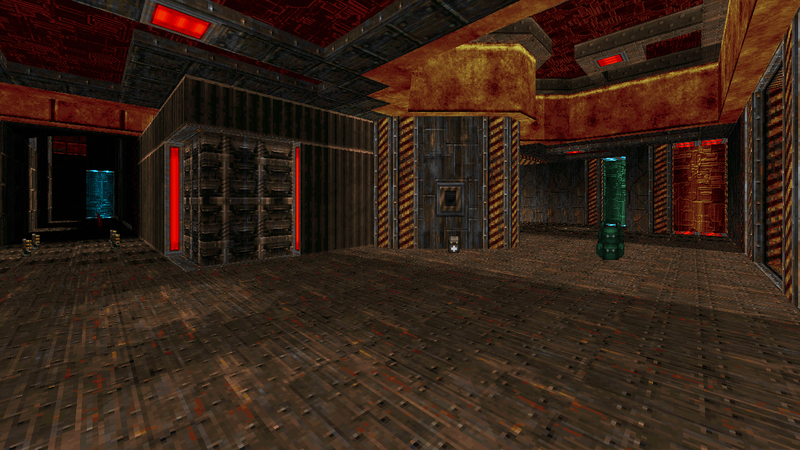 Just be sure to convert all of the textures to the Doom graphic format (Select all textures, go to Graphic -> Convert to…, in the dialog box that pops up, make sure that ‘Doom Gfx (Paletted) is selected, then click ‘Convert All’). 3. Create a new lump entry (Archive -> New -> New Entry) and name it ‘MAPINFO’. MAPINFO is just a text lump that you edit like any other text file. The important bit for you here is the ‘sky1’ property. All you should have to do is put the sky texture’s name where “SKY_TEXTURE_NAME_HERE” is, and it should show up for your MAP01 slot. If you have multiple maps, or a map in a different slot, you can very easily define what sky texture shows up for that slot using MAPINFO. Again, I would definitely check out 32in24-13’s MAPINFO lump as a reference. There are a lot of other properties you can throw in for a map entry with MAPINFO. If your just interested in changing the sky texture, you can do that and leave any extra stuff out (just be sure to define the map slot so the engine knows which map the sky texture is applied to). Okay, thats much better! I see you can also add music that way. I appreciate you taking the time to help. Im glad you got me to download SLADE too.